The ASIMET (Air-Sea Interaction Meterology) buoy in the water. Photo courtesy of Sean Whelan, Upper Ocean Processes Group, Woods Hole Oceanographic Institution (uop.whoi.edu). Wind is difficult to measure over the ocean. Wind gauges (anemometers) have to be mounted on surface buoys or ships that pitch and heave in response to ocean waves. The picture below shows one example of a buoy system that measures wind data for climate models. Buoys and ships distort the winds that the anemometers are trying to measure. 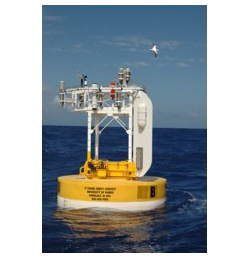 Anemometers mounted on buoys on the ocean surface are also easily damaged or stolen. Oceanographic instruments given the name WOTAN, for “Wind Observations Through Ambient Noise,” have been developed that can be placed safely beneath the ocean surface to record the sounds produced by breaking waves. Because the sound produced by breaking waves depends on wind speed, it can be used to measure winds over the ocean. 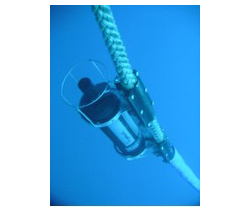 The same instruments used to record underwater sound to measure wind speed can also be used to measure rainfall (Acoustic Rain Gauges (ARGs)). The instrument consists of a hydrophone and some electronics that record the ambient noise at a given depth. Most of the sound of breaking waves is radiated from bubbles trapped under water at the wave’s leading edge. Falling rain produces underwater sound in the same frequency band (How is sound used to measure rainfall over the ocean?). Scientists can tell the difference between rain and waves from wind because the underwater sound levels produced by breaking waves and rainfall have distinctive shapes when plotted versus frequency. The sound levels produced by breaking waves decrease with increasing frequency. The dependence of noise level on wind speed allows researchers to use these recordings to measure the wind speed above the ocean. The noise level does not depend on the direction in which the wind is blowing; therefore, this technique does not give information on wind direction. This technique also only works for wind speeds greater than about 6 kts (3 m/s). Waves do not break at lower wind speeds and therefore there is no acoustic signal with which to measure wind speed. 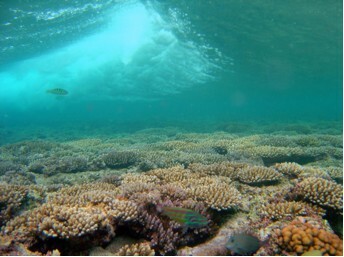 An underwater view of waves breaking over a shallow coral reef near Guam. Photo by David Burdick from NOAA’s Coral Kingdom Collection. Wind is one of the most important components of weather and climate. Winds are the primary driver of large-scale ocean currents. They are responsible for the formation of the Gulf Stream, for example. Improved understanding of the global pattern of wind is needed to improve weather and climate forecasting. Information on wind over the ocean helps meteorologists, oceanographers, and climatologists. Jeff Nystuen, Applied Physics Laboratory, University of Washington, Listening to Raindrops. WHOI Air-Sea Interaction Meteorology: The ASIMET System.